It began more than 20 years ago, in the days before sensors monitored soil health, before smart shelves managed product levels, before artificial intelligence and IoT-enabled cameras reduced violent crime. Before the term “Internet of Things” had been coined, Microsoft Windows was there—but not just on our PCs. It was quietly running on the smallest, embedded devices—the precursors to the intelligent, connected devices of today. In fact, Windows IoT is more than two decades in the making, and now, Windows IoT is helping businesses of all sizes achieve digital transformation and delight customers with secure, modern experiences that bridge the physical and digital worlds. Read on to discover how Windows IoT has evolved into one of the most trusted IoT platforms—and learn about the groundbreaking capabilities that are coming soon. Since the 1990s, we’ve been innovating our popular Windows OS to meet the needs of device manufacturers, providing a familiar, cost-effective, and secure platform. We were already optimizing Windows for small, single-purpose embedded devices ranging from toys to telephones through our Windows CE and Windows NT Embedded products. Over the years, we have continued to build on this groundbreaking work. Back when Windows IoT Core was introduced, it was the first time you could run the Windows OS on tiny computers, such as the Raspberry Pi. Designed for device makers, our initial focus was on development kits and building a community of Windows IoT developers. From there, we expanded to meet the needs of commercial customers who wanted long-term support, including a high-quality development environment. Today, Windows 10 IoT Core is a mature product that enables manufacturers to go to market quickly with small-footprint devices that are secure, low cost, and built for the intelligent edge. Windows IoT Core provides a royalty-free OS for prototyping, developing and testing IoT devices. Providing security and maintenance for a multitude of devices in the field can be extremely challenging, so one of the biggest additions we’ve made recently is Windows 10 IoT Core Services. Windows 10 IoT Core Services ensures long-term OS support and services for managing device updates and device health. Benefits include reduced operating costs with over-the air-updates for OS, apps, and drivers—plus 10 years of OS system support and enhanced security. Additionally, with the release of Windows 10 IoT Core on NXP i.MX 6, 7 and now 8M series of application processors, we have support for industrial grade silicon. Meanwhile, we continue to work behind the scenes on products that haven’t been announced yet. For customers wanting the full power of Windows 10, Windows 10 IoT Enterprise provides a locked down, full version of Windows 10 that delivers enterprise manageability and security to IoT solutions across multiple industries. It shares all the benefits of the worldwide Windows ecosystem, including the same familiar application compatibility, development and management tools as client PCs and laptops. Licensed for fixed-purpose, smart devices, Windows 10 IoT Enterprise features advanced capabilities that make it much easier to configure and lock down mission critical devices. This means that developers can spend more time creating outstanding solutions, without worrying about the nuts and bolts. Like Windows 10 IoT Core Services, Windows 10 IoT Enterprise includes long-term support. With the critical nature of security, being able to get security updates over the course of ten years without having significant changes in the OS is of enormous value. Both Windows 10 IoT Core and Windows 10 IoT Enterprise offer easy integration with the Microsoft Azure platform, simplifying scale and device management, as well as the implementation of advanced features like hardware-assisted machine learning inferencing and containers. Azure IoT Edge extends cloud intelligence and analytics to edge devices, providing a secure and easy way for developers to move cloud and custom workloads to the edge and tap the power of Windows 10 IoT. Azure IoT Edge enables seamless deployment of AI and advanced analytics capabilities, and the Azure IoT Device Agent for Windows makes it easy for operators to remotely configure, update and monitor edge devices. IoT Edge modules, implemented as Docker-compatible containers, enables management of device updates and the deployment of business logic at the edge. Multiple modules can be configured to communicate with each other, and custom modules can be developed to provide insights offline and at the edge. Again, 10 years of ongoing support, security and patch management add to the ROI as well as customer confidence. In late February, we announced the availability of Windows Server IoT 2019, which can securely handle the largest edge computing workloads. Windows Server IoT 2019 brings the power of high-availability and high-performance storage and networking to the edge, addressing latency and connectivity requirements and enabling customers to maintain data on-premises while securely storing and analyzing large amounts of data. Additionally, we’ve got some thrilling product advancements lined up over the course of the next 12 to 18 months, focusing on end-to-end security, simplicity and cost-effectiveness. We are working with OEMs to bring existing devices onto a new, modern OS—and helping them connect to the cloud. 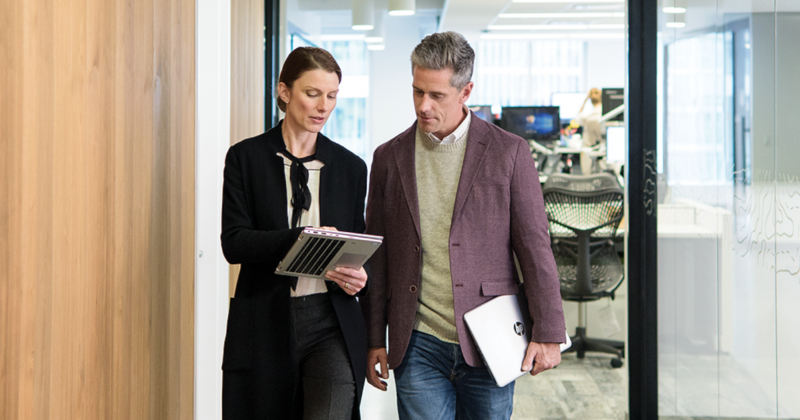 Microsoft is making substantial investments in cloud connectivity and using the power of Windows to accelerate our customers’ journeys to the cloud and the intelligent edge. From a developer perspective, we are focused on efficiency and making Windows a great place for machine learning through innovations like AI at the edgeWinML allows developers to harness the capabilities of any Windows 10 device to use pre-trained machine learning models—both custom and off-the-shelf—making it immensely powerful and ideally suited to intelligent edge devices. WinML accelerates the evaluation of deep learning models on Direct X12-capable devices. It also evaluates on local hardware, enabling low latency and high performance for quick results. A great example of the benefits WinML brings to IoT solutions is IoT-PREDICT. This predictive maintenance solution from ActionPoint runs on Windows 10 IoT Enterprise and uses machine learning, as well as data analytics and advanced capabilities, to help manufacturers reduce equipment downtime, save money and drive operational efficiency. Windows Embedded and now Windows IoT have provided device builders and developers innovative products that offer security, simplicity and flexibility, backed-up with commercial grade support, including 10 years of support with our Long Term Servicing Channel. Windows IoT is accelerating digital transformation and enabling customers to build secure, connected products and modern experiences that delight customers. We’re proud of how we have helped reshape the business landscape through IoT and the intelligent edge. And we’re thrilled about the road ahead. Stay tuned to see how we continue to lead global IoT innovation. Meanwhile, be sure to tune into the IoT in Action on-demand webinar, Windows IoT: Business Transformation, to discover how Windows 10 IoT can help you get up and running quickly. You’ll learn how, with a platform that spans cloud, OS and devices, Microsoft IoT technology is uniquely positioned to simplify the IoT journey. You can also watch the Windows IoT in Manufacturing webinar to hear how our partners are empowering device manufacturers to build secure, connected enterprise and consumer devices with Windows 10 IoT. Watch and discover how you can create trusted, connected solutions that improve business and customer experiences – regardless of company size, technical expertise, budget, or industry. I suspect I’ll need to split this, but will try the whole system. It has barely been used. I’ve played <50h on it. I’ve never mined on it or ran anything more taxing than a game. Everything other than the CPU is boxed. Edit: I’m keeping my SSD, but I’ll include a small ssd with a windows install to show it works. Last week, I had the opportunity to spend two days at the Adobe Summit, where our longstanding partnership with Adobe grew deeper and stronger. The momentum around Adobe and Microsoft was palpable, and I’m thrilled that we’re offering our mutual customers best-in-class solutions to provide great experiences for their customers. It was an exciting week in Las Vegas! During Wednesday’s general session, Microsoft CEO Satya Nadella joined Adobe CEO Shantanu Narayen onstage for a conversation covering digital transformation, creating a learn-it-all culture at Microsoft, and leveraging data to create personalized, impactful customer experiences. We also saw the Open Data Initiative (ODI) in action. As originally announced last September by Adobe, Microsoft, and SAP, the ODI is a new approach to business data that helps companies transform customer experiences through real-time insights delivered from the cloud. Unilever, one of the early global brands to express support and excitement about the ODI, announced its intention to leverage these data connections immediately. At the Adobe Summit, Unilever demonstrated how it plans to bring together disparate customer, product, and resource data and use AI-driven insights to reduce plastic packaging and encourage consumer recycling. By eliminating silos of data, Unilever will connect inventory and plastics data with Adobe data on Azure to enhance customer experiences and encourage participation in this sustainability initiative. We also announced a new approach as part of the ODI for publishing, enriching, and ingesting initial data feeds from the Adobe Experience Platform, activated through Adobe Experience Cloud, Microsoft Dynamics 365, and Office 365 and SAP C/4HANA, into a customer’s Azure Data Lake. This enables customers to use AI and machine learning to generate new, actionable insights that can transform their business. Just after Wednesday’s general session, I had the privilege of kicking off the first-ever meeting of our ODI Partner Advisory Council, along with my colleagues from Adobe and SAP. Our partners will be critical to unlocking the true opportunity presented by the ODI, and I’m excited to work closely with them to develop this initiative further and bring this innovation capability to more customers. Read more about ODI in last week’s announcement. On Tuesday, we also announced a new extension of the Microsoft and Adobe partnership to include LinkedIn. This addition expands opportunities for product innovation and increases value for our joint customers. We’re adding new integrations across Adobe Experience Cloud, Dynamics 365 for Sales, and LinkedIn Marketing Solutions to accelerate account-based experiences – empowering B2B marketers and account-based sellers to easily identify, understand and engage customers, and create better orchestration, measurement, and delivery of targeted content for more personalized experiences. Enterprise sales and large account deals often demand long negotiations, multiple decision makers, and complex relationship dynamics. We believe account-based experience drives success. Today, enabled by deeper data integration across Microsoft, Adobe, and LinkedIn, marketing and sales teams can tailor their offerings to individual customers, understand changing demands, and land complex sales. Read more about this in the announcement from Adobe. Also on Tuesday, Brenda Bown, General Manager for Microsoft Business Applications, hosted a panel with Matthew Jafarian, Vice President of Digital Strategy and Innovation, Miami Heat and Mark Pelletier, Vice President of eBusiness, AAA Northeast. Matthew and Mark represent two of many customers using Adobe and Microsoft solutions to understand and delight customers. They shared their challenges and opportunities, explaining how their partnership with Adobe and Microsoft connects them with people in a more personal, relevant way. This type of business evolution is underway across the globe. In Colombia, Avianca Airlines is focused on creating highly personalized and specific customer journeys for every passenger they fly. As Santiago Aldana Sanin, CDO and CTO, explains, success in the travel business requires a focus on the complete experience, from booking, to the gate, to the air. They are already seeing the value of customer-centric IT with Microsoft and Adobe today. Closer to home, 24 Hour Fitness has pioneered the health and wellness industry for more than 30 years. Today, with the partnership between Adobe and Dynamics 365, 24 Hour Fitness targets and nurtures users throughout their health journey, from exercise evaluation and purchase, to long-term wellness and personal engagement, all on a single digital platform. Our commercial environment is changing. And my favorite part of this job is not the growing list of marketplace applications, services, and solutions, it’s the partnerships. By partnering with industry leaders like Adobe, growing our ecosystem with ISVs, and working directly with customers to build new solutions, we can add genuine value and help transform the world together. Last week’s Adobe Summit was the next step in our ongoing partnership with Adobe. Learn more about how that partnership can transform your business here. Partner enablement has been a key focus for NetApp’s channel strategy since the company began expanding its hardware portfolio into software several years ago. As the vendor reinvented its identity in the marketplace, it looked to bring legacy NetApp partner firms along on the journey. Within the Americas, NetApp derives approximately 80% of its business from 1,500 partners. McCullough said NetApp’s current portfolio, while still rooted in storage hardware, has expanded into software aimed at helping customers migrate to cloud or hybrid cloud environments. NetApp is currently focused on helping its partners in four categories of workloads, he said: AI, cloud computing, DevOps and enterprise applications. “If you think about those four workload areas, they really expose our customers to our portfolio,” he said. Chris Lamborn, senior director of global channel strategy, said NetApp is looking to help its partners navigate a challenging new IT landscape. He noted that buyer profiles and marketplace requirement have changed. Additionally, customers now open conversations by saying they want cloud and consumption-based models without necessarily understanding the full implications. “As a vendor, we have to be able to enable our partners to lead those conversations, and not all of our partners have evolved to that state, either,” he said. Lamborn said a new NetApp partner program is slated for the end of April. Channel enablement will represent an important element of the program’s features. A group of investors led by Steve Pruden, who was appointed CEO of Studio Science in May 2018, has purchased the company from Founder Kristian Andersen. Pruden previously held executive positions at cloud consultancy Appirio, including vice president of strategy and partnerships and senior vice president of human resources. He was one of the executives involved in the transition of Appirio’s headquarters from San Francisco to Indianapolis. Pruden will continue to manage Studio Science’s day-to-day operations, according to the company. He leads an Advisory Council that includes Andersen and Chris Barbin, Appirio’s former CEO, among other executives. The Advisory Council will provide guidance to the Studio Science management team. With YCF, fans call the plays as they vote through a mobile app. The play receiving the most votes is run on the field by the players. Teams consist of former NFL, CFL and college players. YCF hired Cantina to build its architecture, application and game logic and Cantina, in turn, tapped Mission to work on the application’s cloud infrastructure requirements, which call for the ability to handle 100,000 concurrent users during traffic surges. Mission used Terraform to deploy infrastructure to YCF’s AWS environment. The environment also includes Kubernetes for container management, Amazon Relational Database Service and Amazon ElastiCache. Quisitive Technology Solutions Inc., a Microsoft solutions provider based in Toronto, said movie theater company Cinemark has chosen it as a 2019 strategic IT services provider. Quisitive said it will serve as Cinemark’s services provider for “Microsoft-centric initiatives.” Those include application development, data and analytics, Azure cloud, Microsoft Office 365 and mobile applications.